Should reptile shows be legal in the U.K.? Last weekend saw the annual British Royal Pigeon Racing Association show in Blackpool. The show attracts around 15,000 visitors, with over 100 trade stands and around 3,000 animals. It’s the biggest pigeon show in the calendar and, as far as we are aware, it went off without a hitch. But this is a reptile site, so why am I telling you this? Because at the same time as the pigeon show was happening, the UK reptile show scene is preparing for a landmark legal case to determine if reptile shows are legal. The Federation of British Herpetologists, representing the interests of reptile societies and hobbyists, is confident that the judicial review will be a good thing for the hobby regardless of the outcome. Should the review find in favour of the shows then this will be a major blow to the extremist animal rights organizations who wish to see the shows banned. Should the review go against the hobby, then government will be under enormous pressure to revise the loophole in the outdated legislation in British law which makes the legality of shows ambiguous. It is hoped that the shows will eventually be licensed as this will vindicate local authorities who are pressured into stopping the shows by animal rights campaigners. Reptile shows are a hugely beneficial network facilitating the sharing of expertise. Many respected animal welfare organizations recommend hobbyists buy their animals directly from a reputable breeder, and these shows provide the best opportunity to achieve that aim. These shows and relationships help to advance the hobby. More worryingly, should reptile shows be banned then the ruling would likely be rolled out to cover all vertebrate animals – dogs, cats, fish, rabbits and pigeons included. Then where would we be? Although actually of Eurasian distribution, this hefty glass lizard is often referred to as the European Glass Lizard. Commonly an unmarked light to dark brown overall, occasional examples are lighter with variable patterns of a darker brown. Hatchlings are gray with irregular darker banding. It may grow to 3 feet or slightly longer when an adult. Although never of great hobbyist interest, it seems that there has always been a few of these brown glass lizards with the strongly keeled scales available in the pet trade. Prices have always been reasonable. For example, I just checked the Kingsnake.com classified section for "Other Lizards" and there are 2 ads for these interesting lizards asking $75.00 each. Sadly (and perhaps strangely) there are very few O. apodus bred in captivity. Availability has always dependent on wild collected imports. This renders the availability of this taxon vulnerable to changing and ever more restrictive laws. I would hope that we won't allow the availability of this interesting lizard to go the way of the Basin emerald tree boa or the Colombian horned frog, only 2 of many one-time common species that are now very difficult to find in the pet trade. Continue reading "Raise your glass lizard"
As the name itself describes, the vine snake, Ahaetulla nasuta, is a tree-reliant snake that camofluages itself as a vine in foliage. There are five species of vine snake found in India amongst which the green vine snake is most commonly found. The green vine snake has a thin and long body that is expanded when disturbed to show a black and white scale marking otherwise hidden under the scales. The head is elongated and pointed, which appears like a leaf shape having attractive golden yellow eyes with black horizontal pupils. The body colour is bright or dark green with a bluish tint in exceptional cases. The ventral side is separated by two white lines in the greenish dorsal under side. In an adult green vine snake, size varies from 150 to 200 cm. The green vine snake is viviparous by nature. Vine snakes are found across the world including the South American and African continents. Most of the places it is called a whip snake. I never got a chance to rescue this species because my area is a "concrete jungle," full of buildings, but I've come across vine snakes while herping. One fine morning in the jungles of Goa, I was herping for some vine snakes and pit viper snakes through the green trees and cool breeze. Although it was a sunny morning, I could not find anything. Then I took a few steps back and realized I'd missed something due to the previous night's booze effect, and I saw a vine snake hiding himself in the green leaves. It was almost 7am and indeed a good start. Vine snakes are a perfect example of nature’s beauty. Many of my friends call it "a snake from a different planet" because of its appearance, which makes it look different from other snakes. For me, "Green is my favourite colour and vine snake is my favourite creature in green." Ahaetulla nasuta in threat posture by Sandilya Theuerkauf This file is licensed under the license. Green vine snake by Manuspanicker. This file is licensed under the Creative Commons Attribution-Share Alike 3.0 Unported license. Since I live in Gainesville, Florida, and since blue and orange is the official color scheme of the Gaters, the University of Florida football team, it is only reasonable to think that I'm writing about football. And if I gave a twit about the game, perhaps I would be. But the blue and orange I'm thinking of is found from Charlotte and Brevard counties southward to the tip of the peninsula. They are the breeding colors of the males of a fast moving, very agile, introduced lizard. Known as the red headed agama, Agama agama africana, the dominant males of this African pet trade lizard actually have a bright orange head that contrasts sharply with the deep blue body coloration. Non-breeding males may be only slightly more colorful than the olive-gray females. It was more than 2 decades ago that the South African subspecies of this lizard, Agama a. agama, (identified by an all blue-green tail) was first found to be feral in Florida. It is not known whether cold weather extirpated this taxon from Florida or whether it interbred with and was out-competed by the West African form (identified by a tricolored blue-orange-black tail) that is now present in the state. The red headed agama may be seen on bridge abutments, old buildings, and ornamental exposed rocks in gardens and fences. It is quick to notice any movement that it considers threatening and quickly retreats to safety. Pretty? Yes! Does it belong here? No. But this form has been present for about 20 years now and continues to expand its range. It may just become a permanent lacertilian fixture in the state. Continue reading "Blue, orange, and beautiful"
The checkered keelback, Xenochrophis piscator, is one of the most commonly found water snakes in the Indian subcontinent. I call it "the serpentine mermaid" due to its aquatic habitat and a beautiful checkered pattern on its body personifying a mermaid. The word "keelback" describes rough scales in every keelback snake. This snake appears to have a thick, round, and cylindrical body growing more slender toward the tail, with size varying from 140n to 175 cm in length. Checkered keelbacks have large eyes with round pupils, and a checkered pattern of glossy keeled scales can be seen on the upper body with rows of black, yellow, or moss-green checks alternating with white ones. Colours on the fore body can be seen in reddish, greenish, yellowish, brownish, and bluish shades, with white underside and two black streaks behind the eye. These snakes are very aggressive and eager to bite when disturbed unexpectedly. A checkered keelback bite can be really painful because of its sharp pointed fangs, which help it to get a good grip on slippery fish and amphibians. I always prefer using a snake stick while handling a checkered keelback because I had a bad experience in the past being bitten by one, which was enormously painful with a deep scar. These snakes prefer living in marshy water bodies like gutters, drainages, rivers, ponds, and lakes while staying on land at night. If threatened, it flattens its neck and strikes with mouth wide open. It is an oviparous snake laying 20-40 eggs in crevices near water. It was recorded that a female checkered keelback 150 cm long laid 110 eggs at the Pune Snake Park in Pune, Maharashta. It's always fun handling a checkered keelback because of its active behavior, but the experience is scary, too! kingsnake.com has launched a new cassified ad directory of those who have an active profile in our vendor profile system, which launched last year. Listing in the directory is free with the purchase of a classified advertising account, and the listing stays active while the classified account is active. If the classified account expires or becomes inactive the vendor profile, and its listing in the directory, will "hibernate" until the classified account becomes active again. The classified directory has an overview and detailed view of vendor listings, as well as vendors, classified ads, and events listed by state or province. To be listed, current vendors need to update their profiles. You can check out the new Classified Vendor Directory here! If you have a classified account but have not set up your vendor profile yet, you can set up or edit your profile by logging in at http://market.kingsnake.com/account/. If you already have a classified ad vendor profile, there is one minor update you'll want to make: adding a descriptive sentence about your business for the directory. 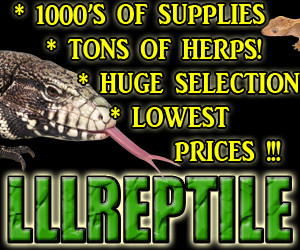 After 18 years kingsnake.com is still the largest and most popular reptile and amphibian classified site on the web. A kingsnake.com classified account enables you to post dozens of ads per day, seen by thousands of reptile and amphibian people worldwide, all for just pennies a day. If you don't have a classified account, need to renew, or want to be listed in the Classified Vendor Directory, you can purchase a classified account for as little as $20 by going to http://www.kingsnake.com/shared/services/classified.php.